The Eureka Copper Canyon 8 is huge and cheap—cheap in every sense of the word. 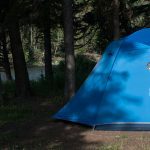 It’s an incredible deal for an eight-person tent but the fabric requires some TLC to keep it from ripping and soaking through in a storm, though the stout pole system will hold up against strong winds. The Copper Canyon 8 is a three-season, 8-person, car camping tent with large mesh windows and a top only rain fly. The Copper Canyon offers an optional divider to create two rooms within the freestanding high-ceilinged tent. When I picked this tent up in its bag, I cringed as the stitching that attached the strap handles to the wispy bag fabric strained. I moved slowly and deliberately so as not to shock the stitching for fear the handles would rip right off of the 34 pound load. During the first setup, I accidently ripped one of the pole sleeves when one of the external pole joints snagged and didn’t let go. This was not a debilitating rip, but it confirmed my concern from picking it up in the bag—durability is a real concern. The floor is not very durable and is made of the same 75-denier fabric as the rest of the tent. I found this to be a huge tent with plenty of internal room that works well if it is restricted to use in mostly dry and non-abrasive environments. Setting up tents this size will nearly always take more effort than smaller tents. The first set-up took some figuring out with two of us. When I tried it alone, I found set-up was awkward but doable with practice. Because the walls and top are separate pieces, it takes a specific process for one person to set it up. Get a friend to help, ideally, get three more friends. Since it sleeps eight, that shouldn’t be a problem. Same for putting it away. Big D-shaped walk-in doors, vertical walls, 6’10” max interior height, huge mesh windows and a flat mesh ceiling all make this tent palatial. The windows open from the inside to easily adjust for ventilation or privacy. Remove the fly for overnight stargazing through the mesh ceiling. It’s easy to prep the fly to pop it on if a sudden storm rolls in. There’s even a slot to run an extension cord into the tent from a generator if you’re setting up a remote office or the like. The sturdy fiberglass and steel poles are the best part of the materials used. Because they are made of fiberglass and steel, the joint tubes connecting folding segments need to be on the outside compared to aluminum or carbon fiber poles where the joints nest neatly and smoothly inside the pole. These external joints increase the risk of snagging the delicate pole sleeve fabric. The tent fabric, mostly the floor, has much to be desired of. The floor is made of the same 75-denier polyester taffeta 1,200mm waterproof fabric as the walls and is likely to puncture or rip if shoes are not always removed, pets forbidden from entering and if the ground has any rough patches, inadvertent rocks or sticks to poke through. Or bring a bunch of blankets to pad the floor. The 1,200mm waterproof coating is on the low end for tents and will start to wet through after a day of solid rain. The floor will wet through sooner if water flows under the tent and gets stepped on repeatedly. If rain is blowing in from the side, it can seep through the mesh and pool at the base of the window flaps and eventually drip into the tent. The sturdy poles will hold strong in a stiff wind and the large windows and mesh ceiling provide excellent ventilation. The Copper Canyon 8 seems like it will be a great deal when size is the only feature compared to price. 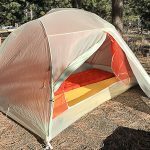 Once in use, users will discover the fabric and construction is probably not going to last a lifetime of camping, much less just a few seasons, even with meticulous care.